What are interesting activities to do for kids during holiday vacation? 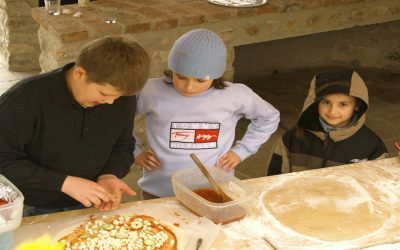 If you want the kids to have memorable times, then we are here to offer amazing activities to do for your kids in Umbria. We are a family destination and we are excited to entertain your kids. What to do for kids during their school break vacation in Italy? They can learn to make Italian pizza with fresh ingredients to make their delicious pizza just the way they want! This will be their true experience of Italy, a country well-known for the best pizza in the world! This is also a meaningful task as your kids will appreciate the food more after having a hardworking and fun time in the kitchen. It will be an unforgettable thing to do for kids & parents. Kids love chocolate, and this is an opportunity to let them understand more about chocolate production. Make your little buddies feel like they are a part of the “Charlie and The Chocolate Factory” story at the Perugine chocolate factory located approximately 45 minutes away. Here you will see chocolate waterfalls and mountain upon mountain of delicious chocolate. And tasting the locally made chocolate is the next best thing to do. Throughout the summer to autmn, there are many food festivals in Umbria to suit every appetite. For chocolate lovers, you will be overwhelmed with chocolate world at Eurochocolate festival, and so many other food festivals. Contact us to find out what festivals are offered during your stay! Let your kids become little farm boys and girls. Lovely goats, dignified deer, cute sheep, clamorous cows, porky pigs, and VERY sweet cats. Many cute animals want to be fed and petted. Bring your kids and see them enjoy the circus our four-legged furry friends create when food comes! So what are you waiting for? You and the kids will know how different types of cheeses are made, for example ricotta and mozzarella. This is an unique experience at local farm that you and the kids can hardly find in ordinary urban life. A picnic lunch will come after when your family can enjoy fresh and delicious dairy products with traditional Umbrian food. These activities are held in a neighboring farm with many animals. At the local farm, you can also buy eggs and milk. Does truffle hunting with a guide dog sound fun? Specially trained, small and clever dogs will lead you through Umbrian forests to find well hidden truffles. Once these smart dogs show us where exactly the “black gold” is hiding in the ground, the honor will be all yours to dig it up. Then a truffle based dinner will be a reward for the day! There is also a famous black truffle festival called Nero Norcia in Perugia where the rare and precious truffle is presented. There are various activities to do for kids in the art studios, such as drawing, coloring and making sculptures. In addition some studios located in Deruta (35 minutes away) offer ceramic workshops or painting Majolica’s which kids can take home as a very special souvenir from Italy!